Knot Just Macrame by Sherri Stokey: Micro Macrame Wrap Bracelet Class and Kit Giveaway! Just in case you didn't hear me shouting it from the rooftops, I've got a new eClass available for micro macrame and I'm very excited about it! So exited, in fact, that I'm going to give away a class and a kit to go along with it to one lucky winner. My class is called Micro Macrame Wrap Bracelet and it's available on CraftArtEdu.com. If you aren't familiar with CraftArtEdu.com, let me give you the skinny. Their goal is to make learning about your favorite medium more accessible and convenient than ever. Their classes have step-by-step instructions and are presented by world-renowned craft and fine art instructors. The classes are all the time, at your convenience. Once you purchase a class, you can view it as many times as you want, for as long as you want. AND your satisfaction is guaranteed. If you're not happy, they will refund your money. That's their promise. Sounds like a fantastic site, doesn't it! They have over 400 classes there - something for all levels and interests. I'm honestly flattered that they wanted to add my micro macrame to their curriculum. I've got two classes available right now. The first is Micro Macrame 101 and it's free. In it, I've covered the basics about micro macrame and the tools and materials you need. The Micro Macrame Wrap class follows after that and is geared for beginners. I will teach you how to make five of the most common macrame knots, while making a fun wrap bracelet. This class is meant to get you acquainted with knotting and working with cord. The next step will be a class I hope to have available next week that will take you further into micro macrame, using finer cord and more knots. And the toggle clasp is fun, too. It's a silver starfish toggle with crystal accents. These pieces should make a great bracelet. So how do you win? Use the rafflecopter widget below to enter. Then check back here on Thursday, July 18th to see if you won! Oops! I'd love to see an earrings class. What a fantastic giveaway, I am watching your video as I am writing this. Any beginner type class would be awesome! I would also love to see an earring class! This would be great because I don't know how to make this type of jewelry. I typically work with wire and chain. I have to admit that the term "macramé" conjures my mom's beige twiney planters from the 70s. I don't think this is my mother's macramé - LOL! I am intrigued.I am partial to wide cuff bracelets. I'd love to learn more about macrame. I know basic knots for hempwork and would like to expand. I'd love to see a micro macrame class for earrings. Thank you for the chance. I would love to know how to use micro macrame to create a bracelet that goes over the back of the hand and loops over the middle finger, sort of like a fingerless glove. I would love to learn this technique so any beginner project would be ok with me. Thanks for the chance to win!! That bracelet is gorgeous!! Macrame fan pattern with beads or a macrame owl pendant. It's really cute. I would like to learn to make this. I'm new and I'm trying to learn everything. I'm so exciting and thanks for share it. I love your work and the classes sound super exciting! Oh, and I'd like to learn how to create macrame earrings! I checked out your class and love it. Would love to win. You are very kind to give away all of this. Sweet! Would love to win this! I actually have this clasp already, and would love to make a bracelet and necklace using both. I guess that means I need a necklace tutorial then! I would love to see anything, Love it all!! I love any kind of macrame...I would luv luv luv to win this kit! can you do dragons adn seahorses?? I admit it..I know nothing about macrame...so little I cant even say what I would like to learn..but I know that I would love to make earrings like the pair you sent me! <3 pick me rafflecopter...pick me..lol! I would LOVE to take your classes .... BUT ....that site only uses Flash to play the videos and my sysadmin will NOT allow Flash on our computers - because of the extreme security risks. (sigh) So, no can do unless they use something more generic and safer than Flash. I'm trying to do macrame, but finding that the knots are not intuitive. Photo instructions aren't doing it for me. A video class would be great! I would love to learn how to do this with such a beautiful kit!!! I would love to learn this technique and own such a lovely bracelet! Well, you know what a fan I am of yours, so I'm absolutely putting my name in! Thanks dear! OOoooooo someone's gonna get lucky!!!! I'm already lucky!! I'm over the moon!!! :D I can't wait to see what this turns into as a bracelet- and honestly, I can't wait to do my own review, because your tutorial just rocks. Love the idea of micro macrame! Any class with new knots would be great! I'd like to see a belt tutorial. I love all of your pieces and have recently ordered two of your kits along with the corresponding tutorials...easy to follow, and I have never done this before, so I do have to say I would love any tutorial....love your work.....thanks! I love everything I've seen and the color choices you've made. Any beginner/intermediate type classes would be great. I'm partial to bracelets! Thanks for offering the giveaway! I particularly LOVE these colors!! As a beginner I loved your blog on cords at the end of May. I made a copy to keep handy until I'm more familiar with them all. I would love to win this class. In the past, I did macrame and would love to "relearn" it on a smaller scale. I'd like to see a class on an anklet or slave bracelet. Oh my goodness! I've been DYING to learn this! Always love a chance to learn something new. 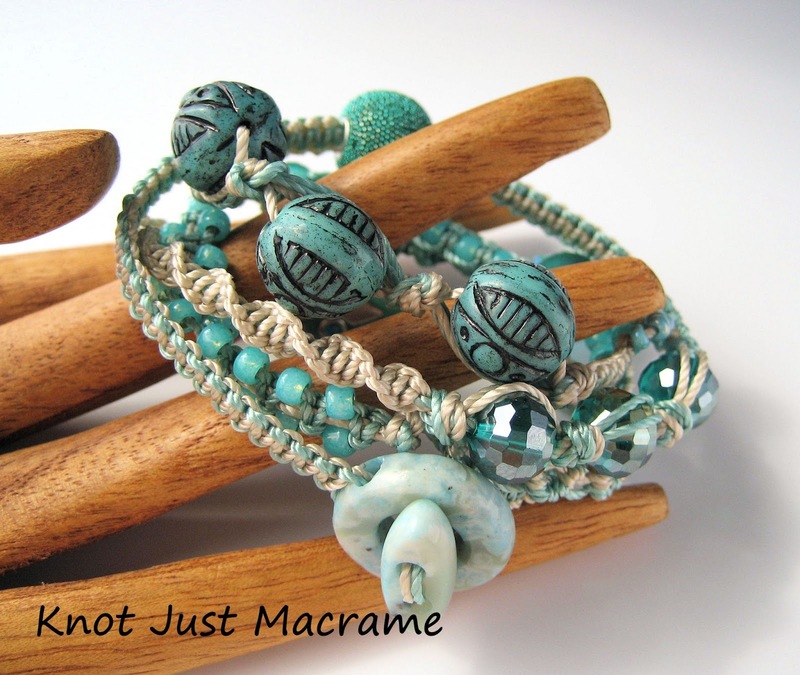 How about micro-macrame to create a focal piece or something to work with my lampwork beads. And my bio would just about duplicate yours except I don't like to cook much but love to sew. The bracelet looks beautiful, the colors and beads and toggles! I really enjoy your blog and projects. I have pinned many of your projects and they have been re pinned. I love your bracelets and would love to see more necklaces as projects. Congrats on being on CraftsArtEdu! I am always amazed at your work and am excited about the giveaway, my colors and beachy theme for me who lives near the ocean. Looks like a gorgeous kit, would love a chance to win. I'd like a tutorial for some beaded macrame earrings. I so want to learn how to do this! I don't know much about micro macramé so I can't suggest a class, but I will eagerly take any you have to offer! Pretty please count me in for this amazing giveaway! Thanks! Thanks for sharing I have never heard of craftartedu before and will be sure to check it out! I tried the knots before but was not very successful. I would love to win the class and give it another go! I'd love to win! I'd like to see a tutorial for micro macrame earrings. I've just started knotting and I'm hooked! This would be a great way to continue leaning and improving my techniques. Thanks so much for playing, the Project looks wonderful, and the cord you're adding in is almost impossible to find in Spain. It comes highly recommended. I'd like to see your micro macrame necklace class. Love this giveaway crossing my fingers! Love those colors--and all your work. A kit would make me finally get off my kaboodle and just try the knots. Thanks for the chance. I'd be happy to try all kinds of bracelets. In the 70s I had a "shop" (craft shows etc) called The Knotty Lady. Each week I'd go to one craft show, or another. I loved macrame. Since the demise of that shop, I haven't finished many projects and would love to get back into the flow. Your pieces are breathtaking. Thank you for inspiring me. I don't know what it is called but I would love to see the necklace with all the separate strings of knots and beads. Fingers-crossed, toes-crossed, eyes-crossed, hoping to win. Earrings would be nice, but what about a freeform class? I would love a class on how to make your unique fan/wave macrame bracelet or a class on making a macrame or soutache focal pendant. I would love to learn macrame. I love your pieces. Your work is beautiful. I would love to win. I'd like a class on how to make one of the fancier wide bracelets. Sheri, your new eClasses look fantastic - what an opportunity to learn from the pro! I would definitely love to kick up my macrame skills from the very basic. Thank you for this opportunity! Love this kit! Can't wait to check out your macramé classes. I have been wanting to delve into micro-macramé - here's my chance. Thank you! Oh I so hope I win this everything about it is awesome! Awesome giveaway! I would love to learn how to make this bracelet, and the colors you selected are stunning. I haven't learned how to do any micro-macrame, yet, but your bracelet looks AMAZING and would be fun to learn how to do!! All of the components for the bracelet are gorgeous (I love all things turquoise!)! Thanks for the chance!! I am really hoping I win this, I really want to learn how to do this. We are always trying to expand the mediums that we use for our designs and this would be great to add. Thanks so much for the opportunity! I didn't know that one could make Macrame jewelry. I only thought flower pot holders. THis is interesting. Thank you, Sherri, for this great give-away....I did macrame waaay back in the early 70s, plant hangers and belts galore! Seeing it back "in" as jewelry is quite wonderful! i am your follower by mail,many thanks for all your interestings posts on your blog..i hope i will learn how to do macramè soon!! Would love to learn this and what better place to start. Always wanted to have a go at macrame jewellery but never got my act together with it. I made a macrame plant pot holder in school many moons ago and really enjoyed it, so think its time I gave this art another go with jewellery. I have been admiring your work and would love to learn to make beautiful jewelry like yours. I would love to see more basics to get me started. been a fan for a while now! I would love Love LOVE, to take one of your classes. I learned and did lots of macrame in 4H, but i wasnt very happy with it becuz it was so 'chunky'. i love how delicate your patterns are, so you will be seeing my name in the class role soon. love the beads and all u picked for the tutorial! I would love to learn how to make beautiful jewelry like yours. Thanks for the chance to win a class. I can't think of a single person that wouldn't love your kit! Great giveaway in here, I am sharing this awesomeness all around the web! You do beautiful work.......................I'm dying to try this. These are my favorite colors. Would love to win! I would love to learn micro macrame...I took a class at the local bead shop a few years ago but never finished the bracelet...and of course, totally forgot everything by now..I love the look and want to be able to finish my bracelet! I would love to learn, too, you have amazing bracelets. I'd love to learn the one you have on your banner! THanks so much for the chance to win! I remember doing macrame in the 70s. Glad to see it's back. Oooo - pick me, pick me! I LOVE you, your blog, your work - EVERYTHING you do! Seriously, I would love to win and learn. Thanks for everything you share with us. Love your micromacrame and would love to learn how. This is the perfect opportunity. Thank you. Many, many years ago I did macrame to hold plant pots. Your site and lovely work are inspiring. I'm thinking of trying your micomacrame and thank you for a chance to win the items and class. Everyone have great day. Wow, going to have to start macramé up once again, love your designs !! I'd love to win - I've tried it before but I'd had trouble with the knots. Hopefully the video would help get me over the hump. As far as another class, I'd like to learn how to make something wider with more rows of beads. This would be a great win! I love your work! I would be happy to see anything you do. Your work is so lovely. I would love to win this! I am having trouble learning micro macrame by myself! Thank you for being so generous Sherry! I would love to see a class with your trademark dragon bracelet or at least that style. And perhaps one on necklaces. I'd like to see a bracelet that's all done in pinks! I'm new to this blog, but was just looking at some micro macramé bracelets and thought I would love to learn this. Thanks so much! Love macrame - used to do it years ago but not in jewelry. Would love to learn about micro macrame in any style or type of jewelry. Thanks for the giveaway! Macrame is entirely new to me, so any techniques incorporating beads are greatly appreciated! Thanks so much!!! A class on the different ways to end and close macreme would be great! A wide cuff bracelet would definitely be fun - you make beautiful bracelets! id love to learn to make shapes like stars, hearts. maybe a seahorse or starfish? I would love to win too as your tutorial is very detailed and easy for a beginner too. I would love to win this. I would like to see more clasp / closure options for finishing a cuff. Also ways on how to bezel stones. Or one to make the amazing dragon bracelets...heeheehee <3 you bunches, Sherri!!! What a great opportunity to win one of your kits! What a generous giveaway! I would love to win this as I would love to try this technique. Best wishes to you! I could so learn to do this. It seems like I'm the knot queen when working with beads. I love the flag bracelet you posted for the 4th of July, that's just cool. I'm not sure what kind of class I would like to see. I haven't yet tried this craft, but it's next on my list. I would like to see progressive classes, starting with beginners and then up to advanced. Thank you for this opportunity! I'd LOVE to try this out- my macrame skills are very basic! I used to macrame with my mom years ago. A refresher course would be helpful but I am a pretty fast learner, advanced classes would be the way to go for me.I love this style and would LOVE to win this and try it out. Would love to see more easy projects for micro-macrame beginners! What a beautiful color combination! I would love to win this!!!!! Well, I am not all surprised there are so many comments. What a fabulous prize! I love your work so much and am a big fan. I would love to learn how to make one of your amazing bracelets and to win the above kit. Ooh. I see how this works - sorry. Would love to see an earrings class! Oh I Wish. I'd love to be able to take several different classes! I SO want this...I have ordered several of your pieces, and love them all! Wow!, I don't know if you'll ever read this or not (you have so many comments), but I am your newest follower and fan. I was a macrame making hippie girl, back in the 1970's, but girlfriend you have taken this art to an amazing new level. Your work is incredible. This might just be the place to shop for my daughter's birthday. She loves unique and artsy jewelry. For that matter, so do I and my birthday is before her's, LOL. I am excited to have found your enchanting blog.